Z Card Pocket Media focuses on getting your brand into the hands of your customers by utilizing their patent protected products that deliver high quality content in the form of Z-Cards, brochures, distribution boxes, direct mail solutions, and Lucite displays. Z-Card has created over 2.2 billion cards globally, and prides itself on producing their products in Canada and the United States. 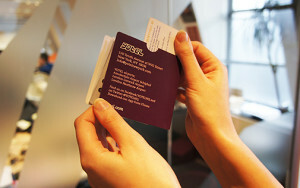 Z-Card has paired up with hotels to create customizable pocket media that turn into tri-fold brochures. Not only is this great for guest communications, but the hotels can use these for property maps, amenity guides, or attractions that are near or on the hotel property. These types of tri-fold brochure printing can be used to keep guests on the property, or help inform guests of services they would otherwise miss. Plus, pocket media has Lucite displays that fits these types of advertising pieces so that they can be neatly displayed anywhere in the hotel. In addition to having the displays set out at the receptionist desk or by the pool, Z-Card also creates tri-fold brochure printing options for bottles. These slip on over the bottle top and create a great way to send information up to a guest when they order room service. Plus, tri-fold brochures are cost effective, are easy to hand out, don’t take up a lot of counter space and are super easy to display! All brochures that are created by Z-Card for hotels are always of high-quality, are always engaging, and can be customized to great length. Tri-fold brochures are great for hotels that want to display a lot of information in a professional format that is easy to read and is easily accessible. To order your custom North America Z Card pocket media, call us at 212-797-3450!